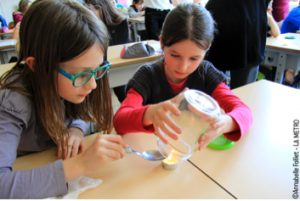 Since 2013, ALEC and Grenoble-Alpes Métropole have renewed the Positive Energy School Challenge each year in metropolitan France and as part of the Air Energy Climate Plan. 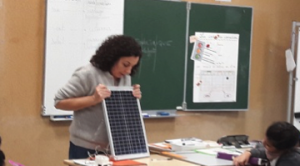 This year, no fewer than 37 classes in 11 schools and 8 metropolitan municipalities, including 4 in Grenoble, have embarked on the challenges of the energy transition. Reduce the school’s energy consumption by changing habits by involving all building users, both students and teachers, in an educational approach. Each class or several classes in a school can then register each year with their commune to take up the challenge and build their project to raise awareness of energy saving. The pupils and their teachers, with the help of the municipality, are setting up an action programme to reduce the energy consumption (electricity and heating) of their school. 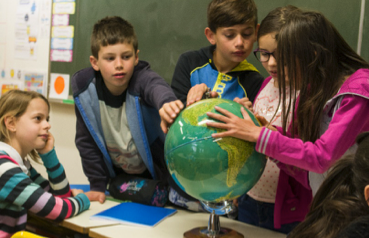 Children, who will be taught about the themes of energy, climate change and air pollution (transport and waste), will be able to become directly aware of the impact of individual actions. Among the educational initiatives proposed, the technical staff of the municipalities concerned, such as Grenoble, come to the classes to explain their work and take the students to visit the boiler room of their school. This is also the case for ALEC agents who travel to schools and carry out educational activities. This project is also an opportunity for municipalities to collect information and energy monitoring of buildings, by checking, among other things, the regulation of heating, ventilation, the replacement of lighting, etc. It is by transmitting these consumption data to the municipality and teachers and their pupils that the objectives of the challenge can then be achieved. As part of the City-zen project and thanks to GEG, ALEC, the backbone of the project, was able to propose in 2017 to a Grenoble school to access consumption data related to the use (lighting, computer use, etc.) of their classroom at a fine time step (timetable). The students thus had the opportunity to analyse hour by hour the evolution of their consumption. Building on the success of this experiment, GEG then proposed to the 10 cycle 3 classes in Grenoble involved in the challenge of equipping them so that they would also have access to this data.